To a small child, the perfect granddad is unafraid of big dogs and fierce storms, but absolutely terrified of the word boo. ~ Robert Brault. 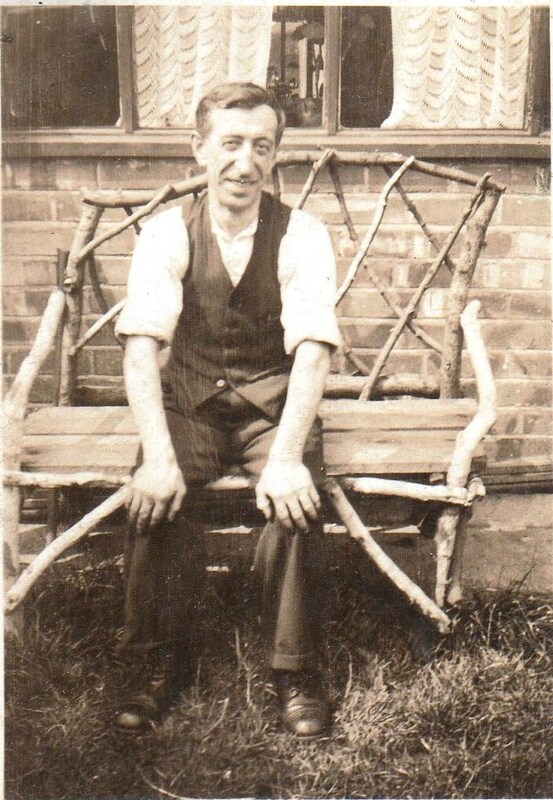 I didn’t have the opportunity of ever meeting my grandfather Samuel Mottershead, he had been gone for many years before I was born, but I grew up loving the man who I knew as “Little Granddad”. From what I heard of him from those who knew him, I know in my heart that granddad was the bravest of the brave, the kindest of the kind and would have been the perfect grandfather to his six grandchildren. No one is about to tell me otherwise, so I will hold this image of him, and the essence of my grandfather close to my heart always. ~ Jo. 20th August, 1890 ~ 30th April, 1946. Samuel, and his twin brother, George Henry, were born the fifth and sixth children of Edmund Mottershead and Alice Hassall. 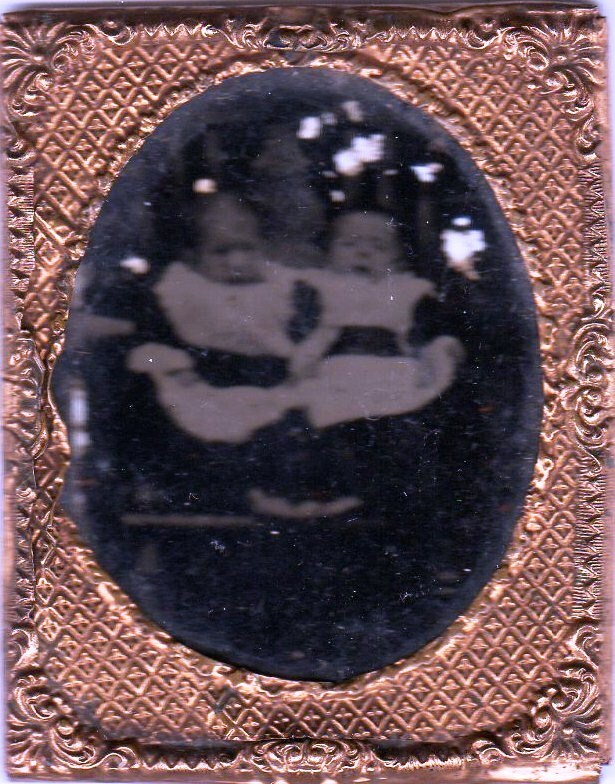 I have only one photo of the twins and although the quality of the photo leaves a lot to be desired, it was significant to the beginning of Samuel’s life. Although dressed the same, I’m guessing from the looks of the babies, they were fraternal, or non-identical twins. I’m also guessing that Samuel is the twin on the right-hand side, as I can see a resemblance to his older photos. Samuel and George were christened on 3rd September, 1890, at Bradford, Lancashire, England. Perhaps the photo was taken at their christening. Samuel was very small in stature. In the photo above, he is the fifth child from the left, second row from the back. Or to make it easier to locate him, look for the tiniest boy in that row, and the cutest….that’s him! 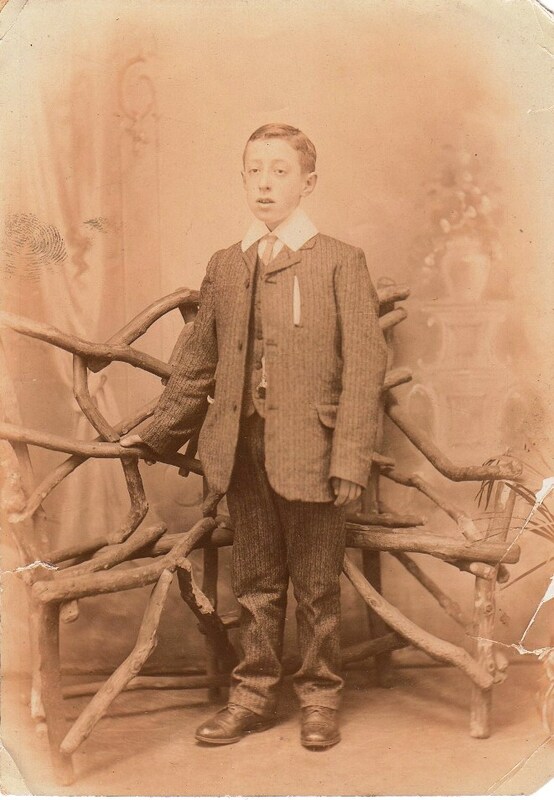 The clothes worn by children going to school in the mid 1890’s were stunning, although I suspect they didn’t appreciate how charming they looked back then. I’m sure the photo above shows the young man Samuel wearing his Sunday best. Unfortunately I don’t have the year that this photo was taken, but have seen the background setting in many other photos taken of this side of my family. I’m sure it was taken at a photographic studio, probably somewhere in Manchester, England. 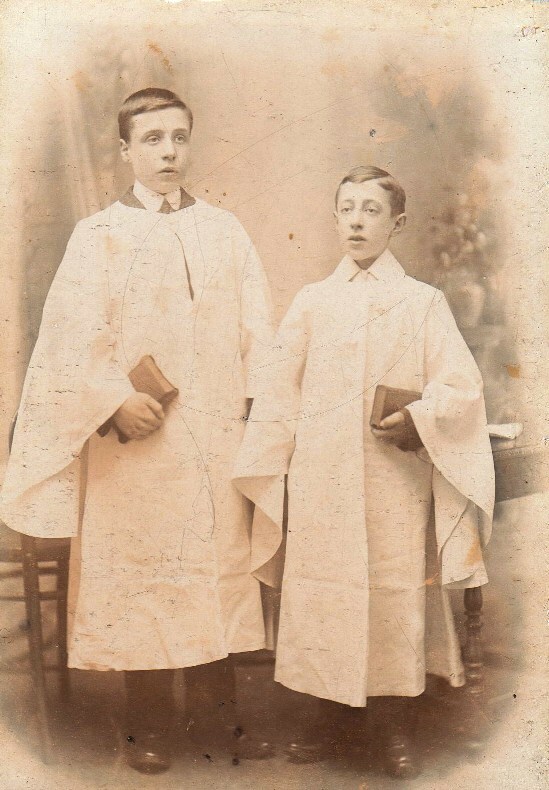 Samuel and his brother Albert, who was two years older than Sam, were choir boys. I know his religion was Church of England and he grew up in Manchester, but that’s all the information I have on the possibility of where he may have sung in the choir, assuming it was a church choir. The books they are holding look like they may be church hymn books. 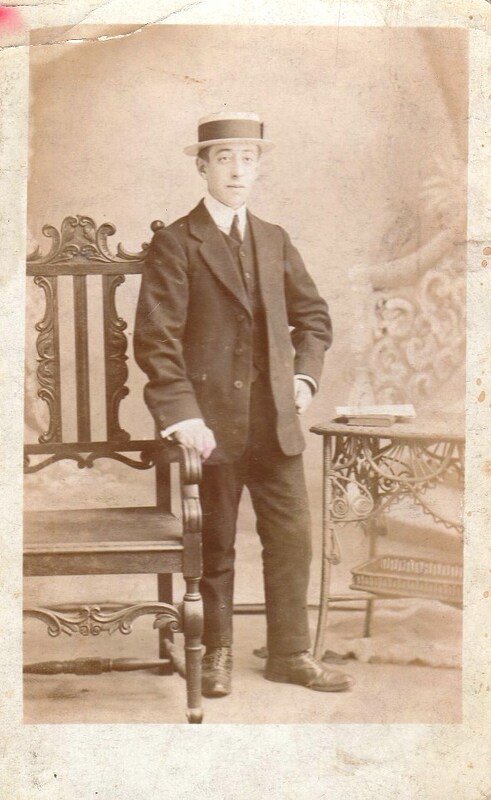 The next photo, above, shows Samuel slightly older, although still a young man. Again, I have no date for when the photo was taken. The photo was made into a post card, with his name, “S. Mottershead” stamped on the back of it and taken by photographer Mrs. B Goodman, from Manchester. Albert and Sam during WW1. 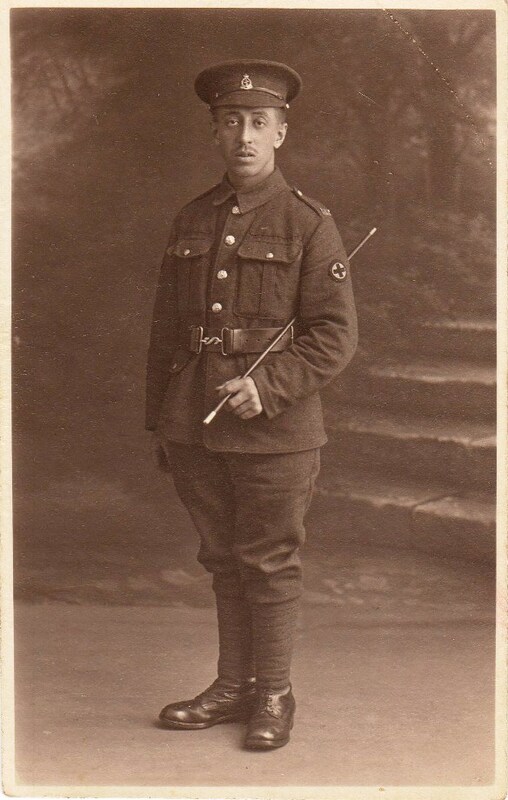 On the 11th December, 1915, Sam joined the British army at Mill Street, Manchester. According to his army record, he was five feet and half an inch tall and his address was 220 Palmerston Street, Beswick, Manchester. During his time in the army he was awarded the British War Medal and the Victory Medal. 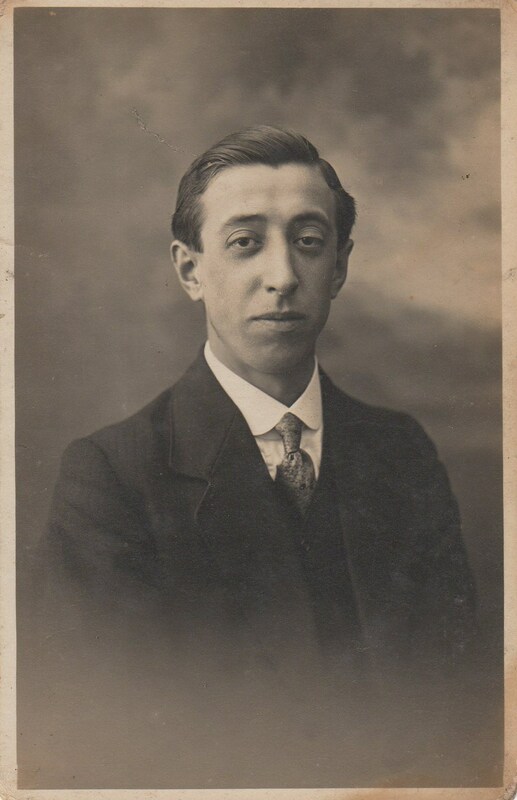 Sam’s brother Albert had emigrated to Australia by the outbreak of the war and when Albert took leave whilst in the vicinity of his family, he would visit them. 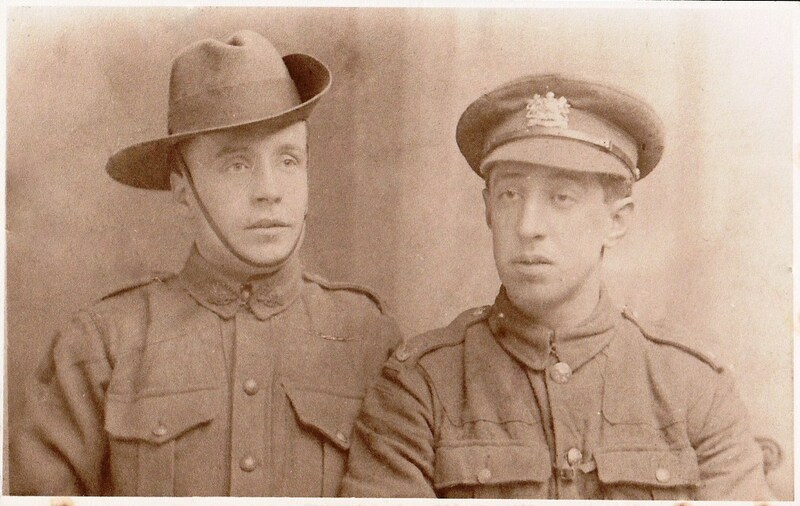 The above photo shows Albert, wearing his Australian army uniform, with Sam, the British soldier. The above photo of Sam, looking tanned, moustached and wearing his army regalia was taken at the Van Ralty photography studios in Manchester. It would be wonderful to know when my grandparents met, but alas I have no romantic story to tell, nor any wedding photos. 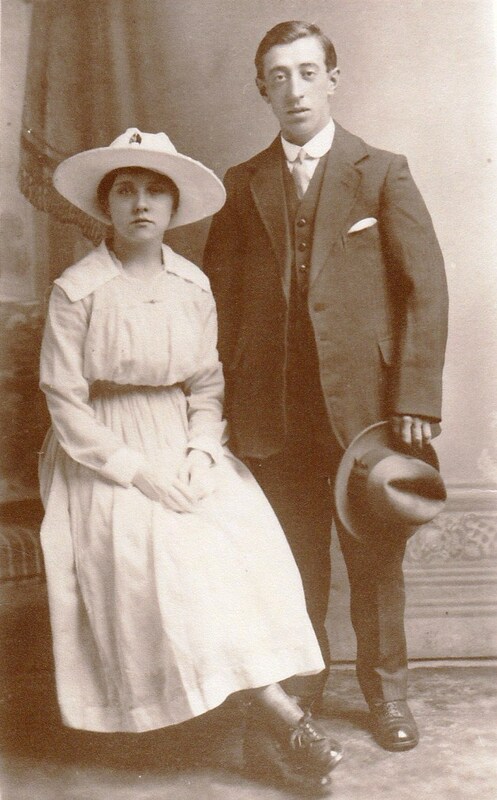 Above is the earliest photo I have of the two of them together, however Samuel married Florence Edith Thompson on June the 28th, 1919, at St. Mary’s Church of England, in Beswick. I can only guess that this photo was taken at around the time of their marriage. Sam and Florence were parents to three sons, Samuel, William and Ronald and a daughter, Margaret. Samuel, the son, with Samuel, the father in 1941. 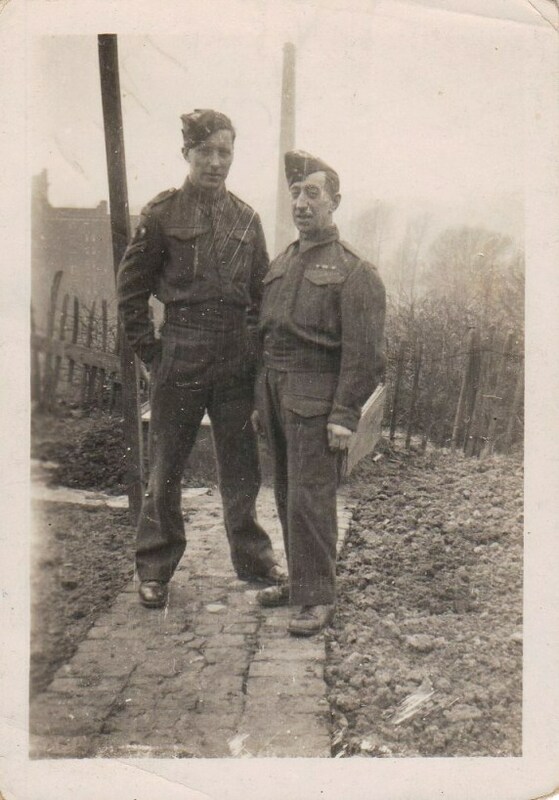 Sam remained active as an army volunteer throughout his life and posed proudly with his eldest son and namesake, Sam, during Sam’s time in the army during WW2. After leaving the army, Sam’s health slowly declined. His lungs had been badly affected by the various gases used in battles during World War 1. In 1945, a year before his death, Sam wrote to his employer, the Manchester Corporation Transport Department, tendering his resignation, saying he must be “resigned to the Will of God”. Granddad passed over on the 30th April, 1946, just two months before his third granddaughter, Vivien, was born. In May of 1946, Granddad’s eldest sister, Alice, wrote a letter of sympathy from Australia, to my Grandma Florence. In the letter she expresses her sadness at the loss of her brother, after looking forward to the family coming to Australia. She remembered him as a lad in his twenties, loving and loved by all. Alice also talks of the strain on my Grandma, with having nursed my Granddad to the end. He was only fifty-five years of age. 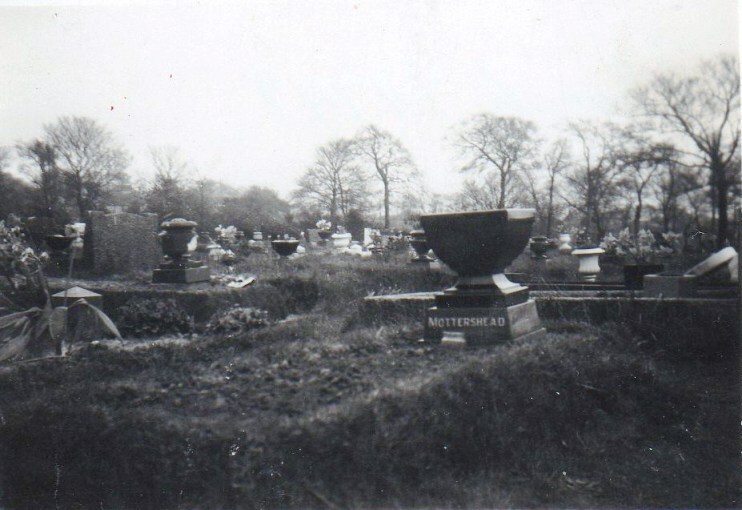 Granddad was laid to rest at Highfield Cemetery, Romiley, Cheshire. Although I wasn’t lucky enough to know my Grandfather in person, I feel as if I know him from hearing my parents talk about him as I grew up. I know that my Grandfather was an avid reader, well educated and double jointed! He was a highly respected man, well mannered and a thorough gentleman. My uncle Bill preferred not to speak of his father, who had passed away on my Uncle Bill’s birthday. He never celebrated his birthday again, due to the devastation he felt at losing his father, who he thought so highly of. I don’t think Uncle Bill ever quite got over the loss. My parents both held Granddad in the highest esteem. My mother always referred to her father-in-law as “Mr. Mottershead”, as a sign of respect for him. She told me that she missed him after he was gone and had enjoyed talking to him. And of course, my father adored his father! This is Little Granddad’s fob-watch, one of my most treasured possessions, which I inherited from my Granddad. Dad had it during my younger years and I often asked if I could look at it and hold it. Knowing how much I love this watch, my parents passed it on to me. It no longer works, and one hand has come adrift, but that’s okay. 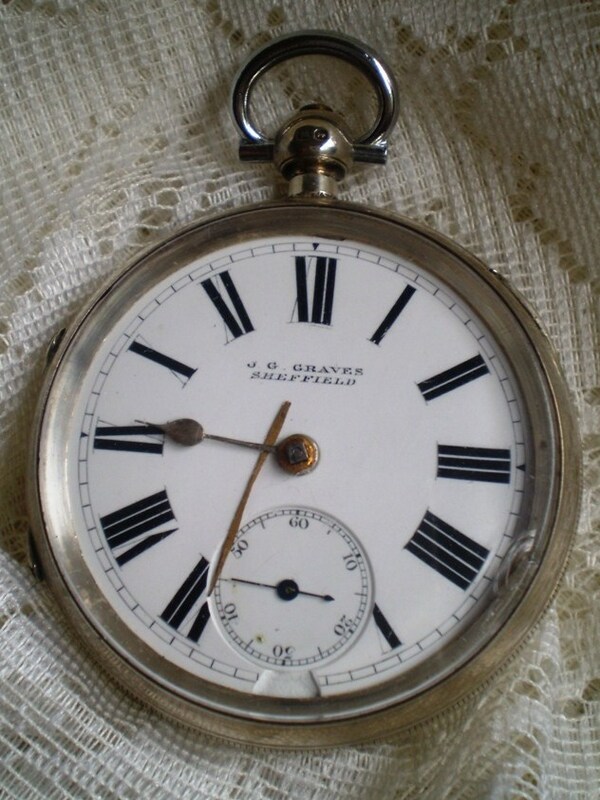 I can still hold this watch and know that once upon a time, many years ago, my Grandfather, a wonderful, highly respected and greatly loved man, Samuel Mottershead, held this watch in his hand too. A nice story and well put together Jo. I bet you could get that watch repaired for less than you think. Thanks Mike. I tried a few years ago to have the watch repaired. Our jeweler had to send it back to England, as there was no one in Australia who had the know-how, yet when it came back it only kept going for a few months, stopped again, and the hand fell off! A great blog. Enjoyed reading very much. I hope you can get the watch working once more. Thank you so much for dropping by….I tried to get the fob-watch fixed, but the repairs weren’t successful. I still love it though.